PROS:Fully featured, free and fun! 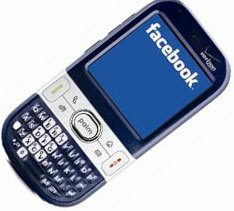 Handset-optimised app is a must-have for facebook fans. 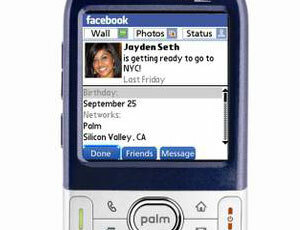 Released with Palm's now typical - and utterly baffling - lack of PR fanfare is a native Facebook client for their Palm Centro, Treo 755p and Treo 680 smartphones. 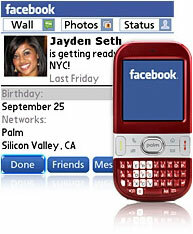 Encouraged by very healthy sales of its cut-price Palm Centro handset (sales are expected to hit two million for 2008), the Facebook client should prove a very good fit for the Centro's consumer-orientated market. The application can be freely downloaded at go.palm.com/facebook or over the air at mobile.palm.com/facebook and is rather a slick affair too. The program is an updated version of the app already available for Blackberry handsets and is gives social networkers all the touchy-feely gubbins they need to keep connected every second of their waking day. Packing a comprehensive feature list, the program lets you send and receive Facebook messages, and respond to friend requests, receive News Feeds, change your status - and check your friends' status updates on the go - browse and search profiles, post messages to friends' walls, and send friend requests. A handy 'Contacts' tab aggregates all your friends phone numbers, letting you view your no-doubt impressively hefty list of chums and dial or text them directly. Best of all, the phone camera's can be used to snap pictures and then instantly upload them to your Facebook account, or select pictures already on your phone. Unlike the iPhone browser-based version of Facebook, Palm users have the edge by being able to take and upload video clips directly from their handsets. We have to say that we found the program horribly addictive, firing off photos from our phone at the drop of a hat, and nervously checking friends statuses on Saturday night to make sure they weren't having more fun than us. Being able to browse your friends latest pictures in full screen glory - or seeing where your ugly mug has just been tagged when you're out and about - is a heap of fun, and the program adds great value to Palm's remarkable little Centro handset.